Summer is just around the corner, and that means swimming! There is nothing like relaxing by the pool on a hot sunny day. A pool basketball hoop, either poolside or floating a hoop, is a great way to keep the kids active and having fun. There are 2 main kinds of basketball hoops for the swimming pool: Floating, and those which sit by the side. The floating type is generally less expensive than the the poolside type because they made of less expensive materials. Poolside basketball hoops are sturdier and made to last. One thing to keep in mind with some of the poolside models is that many of them have metal components that tend to rust over time after exposure to the elements. When you read reviews you will find many people complaining about this. Hey, nature is what it is! Over time rain and sun takes it toll! But it’s really easy to protect your investment with some Rust-oleum. So if you decide to go for a model that has a metal pole or rim spend the extra few bucks and coat the metal with it. The Lifetime Poolside is simply one of the best pool basketball hoops you can find. If you take the time to coat apply some Rustoleum it can withstand weather and heavy use, and it will last for years. Lifetime backs it with a full 5 year warranty. It features a 44 inch backboard made from high-density polyethylene. Even the most rambunctious group of kids won’t break it, and they can hang on it all day and it won’t do any harm. The pole adjusts from 4 to 6.5 feet, so this will grow with your kids provided many years of pool basketball enjoyment. 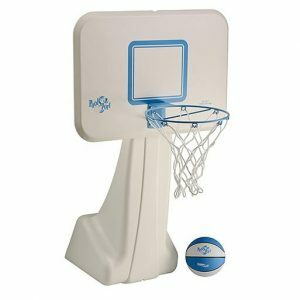 The rim itself is full size so you can use any standard basketball, and the net is made of a durable nylon. The metal assembly claims to be rust-resistant, but a no rust pool toy is rare. Rust-oleum will keep the basketball hoop in top shape. The PoolSport Basketball Hoop from Dunnrite provides a great plastic base option. Be sure to stick with the stainless steel rim model, or else rust can get everywhere. This long hollow plastic base fills with water to make a steady anchor. Smaller water basketball hoops like the short Cool Jam Pro Swimline don’t have an anchor base at all! The design of this hoop does not adjust in height. The shorter height is ideal for younger kids. Even with small kids, it is still unsafe to dunk and hang from the rim, even when sand fills the base. Also the 14 inch rim will fit a full-size basketball, but not very easily. This set does not come with a ball, but small pool balls or four square balls work with this rim. What we like best about the Swimline Cool Jam Poolside Superwide is in the name: this sucker is wide, 44″ wide to be exact. And the sides are shaped inward to bounce the ball back into the pool. 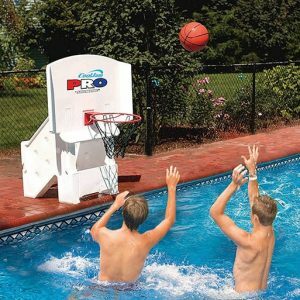 This will reduce missing the backboard entirely so you can stay in the pool rather than be jumping out to chase the ball. It is adjustable to 3 heights, so it will be great for all ages. Older reviews on Amazon report that the rim is not as sturdy as it should be. Don’t let that stop you from purchasing this product, they are doing a much better job with it now. The only metal is the rim, and it will rust so don’t forget the Rust-Oleum. Some folks have reported that the screws rust too, so don’t forget to give them a good spraying too. Includes a regulation size game basketball. There are quite a few reasons to love the Poolmaster Pro . It’s a durable basketball hoop for the pool that’s built to withstand the elements. The rim is made from a a durable all-weather polyform plastic, so unlike others there are no rust issues. The hoop is 14″ and it comes with a ball. The base fills with sand or water to keep it in place. 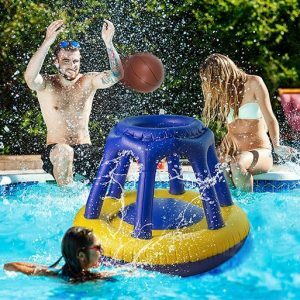 The height is not adjustable, and this is a smaller pool basketball goal set, so if you are wanting something larger and more substantial this may not be the best choice for you. But if you are looking for a fun game for the pool this might be the one for you. 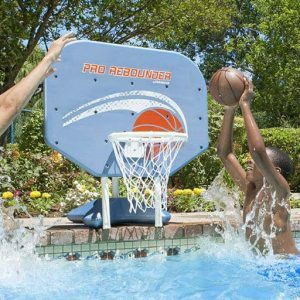 And the Pro Rebounder is a less expensive choice than some of the poolside basketball hoops we chose for this article. 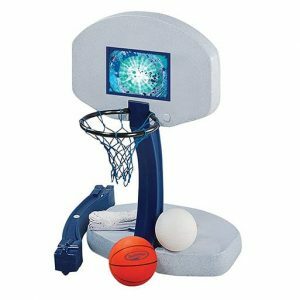 That’s right, the Swimways 2 in 1 is bot a basketball hoop and a volleyball game for the pool. Hard to beat that! This includes 2 basketball bases and hoops, so you you can put one on each side of the pool and have a legitimate game. Each base also serves to hold up the 24 foot volleyball net. If your pool is not that long you just wrap the net around the pole to make it fit. There are no metal parts, so no need to worry about rust. 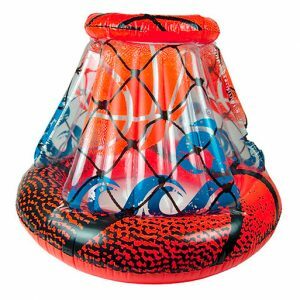 It is very reasonably priced, and you really can’t go wrong with this thing for hours of fun in the pool. Includes 1 volleyball and 1 basketball. Splash Point takes water basketball to a new level with their jumbo inflatable basketball hoop! This sucker measures 48 inches across and 32 inches tall. Kids love a floating hoop that doesn’t fold up or tip over every shot. This one offers superior buoyancy with its wide base. It also comes with a water basketball and inflating needle. All you need is a pump and some kids to have fun with it! Even bigger than the Jumbo Splash, the Sable measures 47″ tall and 36″ wide! This is truly a great product, it’s very sturdy and leakproof and it comes with 2 repair patches in case it does get punctured. A ball is included but it does not include a pump. And Sable backs with a risk-free 30-day guarantee, so you have nothing to lose by trying this floating hoop out. As mentioned above, you may start by purchasing some Rust-Oleum spray paint to prevent your new pool basketball goal from rusting all over the place. Also, there are many waterproof basketballs available on Amazon (as well as football, volleyballs, Frisbees). You can buy a full size 29 inch diameter ball, but that may not fit through the smaller rims as well. Junior all-stars prefer junior sized balls, such as the Dunnrite Youth Swimming Pool Basketball (25 inch diameter). Also, four square balls or other little rubber balls fill in nicely if you lose or puncture your pool basketball. We hope that you have learned from our pool basketball hoop reviews! This great toy encourages activity and play for a large range of kids and families. Please keep an eye out for too much horse play, and make sure that an adult is supervising younger swimmers. For more fun-in-the-sun activities, check out our list of fun beach games for kids. Also, see how to start a new hobby with our Beginner’s Fishing Guide. Have a great summer!